People wander through life aimlessly without a sense of purpose. We risk being manipulated and taken advantage of without knowing our own truth and our value in our own eyes and the minds of others. We risk our creative spark and heart fire being extinguished without strengthening our connections with every interaction and having an idea of what our own standards are. I’m ready to live on my own terms. I’ve fought my way into Valhalla, moved freely in the Tao, killed my ego to enter Nirvana, and climbed the stairway to Heaven. I’ve been comfortably numb behind walls of my doing. I’ve scaled those walls and broken through in places I call my own. I’ve frozen in hell after being burned alive with desire or unable to help others with their pain or suffering. I’ve swam the depths of Hades alongside the dead spirits of those unwilling to live from their own center without a sense of inner stillness. Exploring these mythological realms I’ve found one truth echoed by others of various sects when we enter true dialogue when we explore meaning together. Life is what we make of it. We make life out of the interactions and feedback from our environment. This perpetual feedback is caused by the actions we took resulting from our decisions and choices. How we value ourselves, others and our environment lead us down one path or another. Knowing our values and holding ourselves to the standards we create is the only strategy to create the lives we truly want. I am the light in my darkness. My light comes from the cathartic travels to places my soul is made of. Heaven and Hell are spread upon the earth and yet we do not see it. We feel it and experience it but do not comprehend it. It’s easier to project these experiences on to arcane books of lore. Our rational lives are so entwined with egoism, doubt and uncertainty, we fail to experience the base nature we integrate with moment to moment. To foster this connection and continually reintegrate we have to let go which feels like death. It’s the dying of our attachments, ego-bound delusions, other feelings of being right or thinking we’re better than others. With this in mind, I’m ready to die so I may live with life. I’m ready to live freely while integrating with others and the environment at the same time. If there’s an essence of the biz of you, it is this. 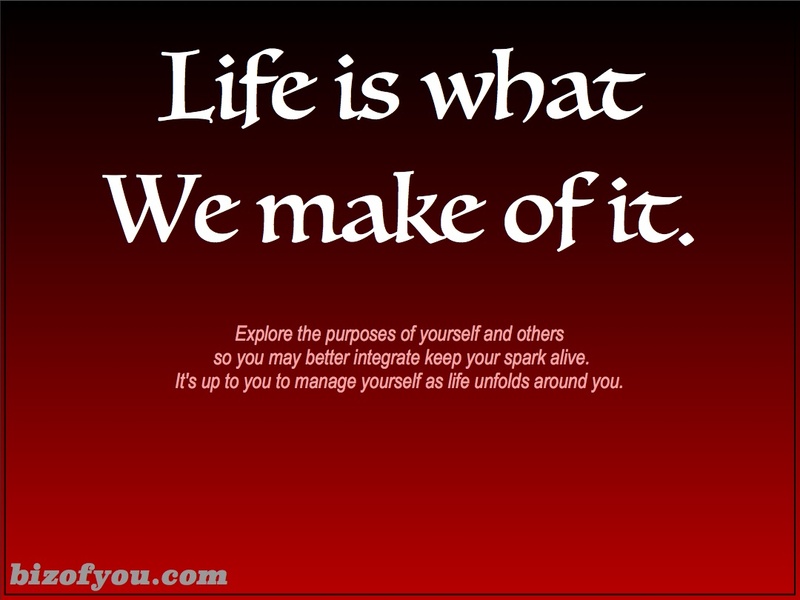 To manage our biz, we seek and explore our integration with the systems we interact with so we may keep our spark alive. We give ourselves meaning by fostering the resources that serve both the purpose of ourselves and others as reality unfolds around us. No matter what happens it’s up to us to keep our heart fire, emotional acumen and rational flexibility alive as life is what we make of it. Manage yourself and make life what you truly want.